abstract Sahi Pro v6.0.0 is a major release and contains many new features and fixes. The focus of this release is tester productivity enhancement. warning This release has significant changes in userdata folder. Please do not upgrade on an existing installation. Please do a fresh installation of Sahi Pro 6.0.0. in another folder and copy over your older userdata/scripts folder to the new installation. Also selectively copy changes from userdata/config files to the new installation. Scenario files (.s.csv) and Data-driven Suite files (.dd.csv). The Context pane of the editor lists all known functions in the script directories, making discovery of functions very easy. and also create new functions through the "Create Function" dialog. This prevents testers from writing duplicate functions or making mistakes in function names or parameters passed. Object repository entries are also visible and editable via the Context pane. Scripts and suites can be executed directly from the Editor. Functionality of the older Web based testrunner (available upto v5.1.2) has been integrated into the Editor. or run in parallel on a single machine or run distributed across multiple machines with parallel instances running on each machine. Simple or data-driven suites can also be created on the fly using the Create Suite functionality. Ant targets for running with builds can now be created from the Script Editor itself via the "Create Ant Target" functionality. Read more in "Triggering Sahi Pro from Jenkins" section. Sahi Pro needs real browsers to playback test scenarios. But most Jenkins/build machines run in server mode and do not have a GUI. This forces end users to either try with headless browsers or to execute Sahi scripts remotely. Sahi slave machines (SL1, SL2, SL3): These are slave machines with Sahi Pro running on them. Jenkins pulls the latest scripts from the Source Control Management (SCM) system. It calls the Sahi ant target. Sahi target copies over the scripts from Jenkins (J) to master (SM). SM then copies scripts to SL1, SL2, SL3, distributes the execution and collects all reports. Sahi ant target then pulls reports from SM to Jenkins. This allows Jenkins to remain a headless server and does not need Sahi installed on it. Also all distribution of scripts and pulling of reports happens through Sahi's ant target itself. Object repository is now tightly integrated in Controller itself. Once a Object Repository file is chosen, an element will always be identified first by its OR entry, even when not in recording mode. This prevents the same element from being identified in multiple ways in different scripts. When elements have been smartly identified using Relational APIs like _near or _under once, newer recordings on those pages will simply use the OR entry, so other users do not need to worry about doing it again or wrongfully using a different identification mechanism. There is also provision to modify existing OR entries. a table or a div containing a graph. Have a look at _takePageScreenShot API for usage. On script failure or error, Sahi logs now shows the stacktrace of function calls, allowing easy navigation to calling functions. API _lock allows synchronization between scripts. When a lock on one label is obtained another script cannot obtain the lock on the same label and will wait till _unlock is called. All scripts now automatically include global_include.sah file during playback. Common error handling functions like onScriptError and onScriptFailure can be defined here. Sahi Pro 6.0.0 ships with a default global_include.sah with default implementations of error callback functions. It is now possible to search both by suite and script name and also see scripts executed as part of suite runs. Graphs on suites reports page have been improved to present information better. asserted for their visual correctness. Sahi Pro so far had support for native keyboard events. From 6.0.0 native mouse events are also supported. This allows complex functionality like dragdrop across multi domain iframes, complex file upload controls etc. _isVisible: $checkZIndex and $doScroll have been newly added. Scripts written before 6.0.0 do NOT need changes. _takeScreenShot: $format and $resizePercentage have been moved into a $props parameter. Scripts written before 6.0.0 will need changes. _scriptStartTime: Returns a Date object. Previous versions returned a String. Scripts written before 6.0.0 will need changes. _lastAlert: _lastAlert now takes an optional parameter $allalerts. If $allalerts is true it will return all alerts encountered in that session, as an array. Scripts written before 6.0.0 do NOT need changes. _lastConfirm: _lastConfirm now takes an optional parameter $allconfirms. If $allconfirms is true it will return all confirmation messages encountered in that session, as an array. Scripts written before 6.0.0 do NOT need changes. Set button has been removed from Playback tab in controller. You can directly Play a script. Configure screens can only be accessed from local machine, so one cannot access another Sahi server and look at its properties. One can reset this behaviour by setting configuration.allow_remote_access=true in userdata.properties. If a node does not have the browser available, DRun will automatically distribute the scripts to other nodes on which the browser is available. Logs can be viewed in English if "〈=en" is added to the logs URL. Suite Name and Script Name have been added to the Filter criteria. One can filter reports using either of these fields. If Suite Name is chosen, suite reports that match the suite name will be displayed. If Script Name is chosen, all scripts and suites containing the script would be displayed. One can configure the maximum size of attachment sent with email after a run. By default, there is no limit on the size. To change this, add mail.max_allowed_attachment_size=<size> in userdata.properties. <size> is to be specified in bytes. 0 means no limit. One can configure the CSV separator to be used when dealing with Data driven suites(.dd.csv), .csv and Scenario files(.s.csv). By default, this is a comma (","). But this can be changed, say to a semi-colon(";") by setting csv.word_separator=; in userdata.properties. This csv separator will be used when running a data driven suite. It will also be used when loading and saving a scenario file or data driven suite from the Editor. Reports Export to Excel functionality enhanced. Added ability to specify downloadable content in content_detection.txt. The pattern to add looks like download:.*abc.*. If a page's initial content matches this pattern, it will be downloaded. This is useful when one cannot use download_urls.txt for this purpose. Example: Assume a webpage that displays some HTML content and a Submit button. On pressing the Submit button, the server returns an XML response. Assume that the url does not change in the response. Since the response is XML, Sahi cannot process this page. Hence it has to be downloaded. But putting the url in download_urls.txt will cause the first page also to be downloaded. So instead, find a pattern in the starting content of the second webpage and add that pattern in content_detection.txt. If a cell has a formula, getData and get functions return value instead of formula. Added a method getCellFormula that returns formula. Added getCellObject that returns a Cell POI object. Added getCellFont that returns a Font POI object. Handling domains with protocols in _selectDomain. Made NTLM transparent authentication configurable. Added AccessControlAllowAllResponse for crossDomain Access of Sahi urls. 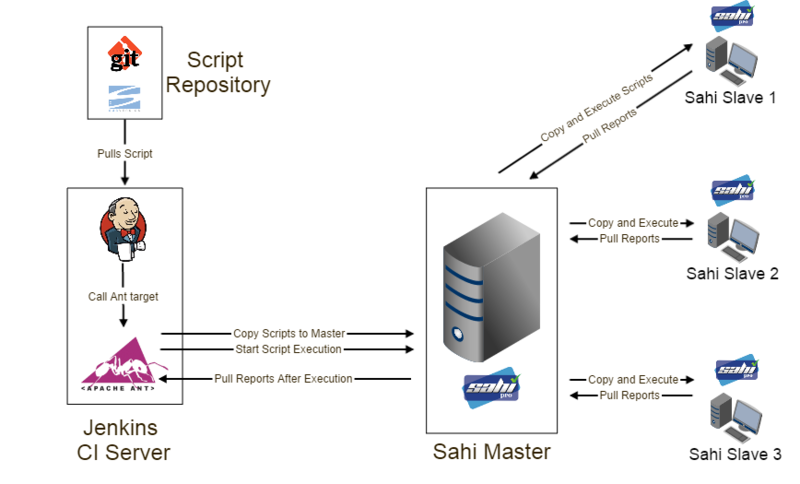 Added a document that explains how Sahi can be integrated with external tools. It provides a step by step list of all URL calls that might be required for a complete integration with Sahi. XHR ready state 1 default wait time added. Applet automation has been reimplemented to need less interference from end user. Added exclude_inject_applet.txt to exclude specific applets from being injected by Sahi. Fixed _takeScreenShot and _takeScreenShots for phantomjs. Updated graphs for dload reports. Added Step-vs-Time and URL-vs-Time graph for dload tests. Dload now runs the subject script 3 times at each noise level, and shows average time. The number can be changed by setting dload.number_of_time_subject_execute=<number> in userdata.properties. Added Pro and OS versions to documented APIs. _checkbox and _radio are now recorded with _check and _uncheck instead of _click. Attribute type (ID, Name etc) can be displayed for Attributes in the Controller Alternatives dropdown. This is configurable through "controller.display_attribute_type.enabled" in userdata.properties. By default, attribute type is not displayed. if strictvisibility is true, recurseInFrames ignores invisible frames and iframes. Added line information for script parsing errors. Added implementation for _sahi.SKIP_SCREENSHOTS and _sahi.SKIP_ASSERT_SNAPSHOTS. If _sahi.SKIP_SCREENSHOTS is true, APIs that take screenshots will be skipped. If _sahi.SKIP_ASSERT_SNAPSHOTS is true, APIs that assert screenshots will be skipped. In drun, only available browsers are now used. Time taken for drun was updated twice - once before and once after log creation. Corrected total steps count in logs. Fix for drun offline logs not showing images. Copying only if image exists. imageDirectory is now created, if it does not exist while creating offline logs. Fix for testcases reporting. Once a sript failed with an error, further testcases were not being logged. Also fixes duplicate error logging in Excel framework. Sometimes a blank line with timestamp was visible in logs. Takes care of unicode in logs and controller playback tab. Fixed Log_highlight to show unicode characters properly. _readCSV fixed for handling empty rows. Fixed saving script bug with extra new line on top. XHR monitoring in IE fixed. Default lock timeout increased to 1 minute from 5 seconds. Added configurable delay time for typeNative Safari bug. Default time is 10 ms.
Changes made for showing NaN for time taken in Log in IE and firefox Browser. Added Confirmation message in Controller Record functionality, if file already exists. Fixed "SSLProtocolException: handshake alert: unrecognized_name" by setting jsse.enableSNIExtension=false. 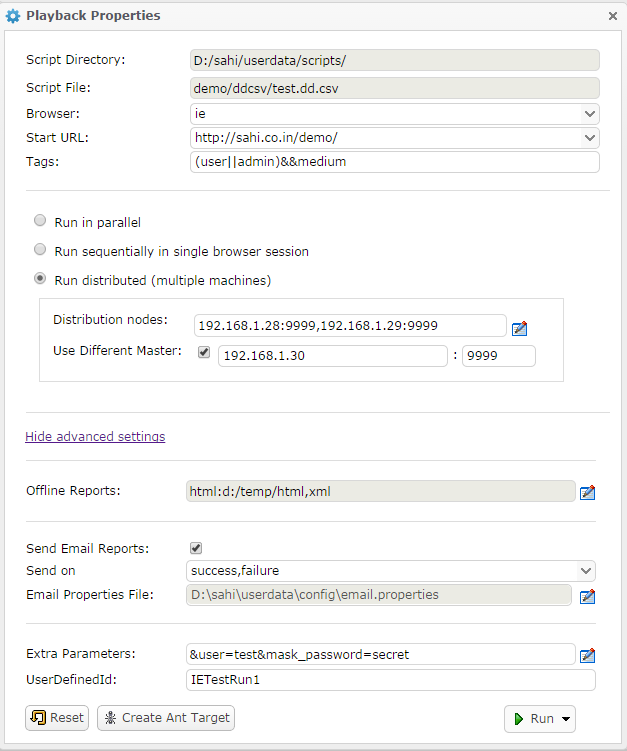 Prevent NTLM auto login and prevent caching of NTLM credentials. Noise data is no longer stored in the database for dload. _windowAction() will now fail gracefully upon call in Linux. _collectAttributes() was returning null if the collection array is huge. Now HARViewer works in H2 db as well as MySql. Alerts did not appear when recording script. Fixed bug - When running a suite in Opera 24, the log incorrectly shows Chrome. Fixed wrong message in assertExists failure. domainfix.txt file no longer needed. Sahi automatically handles this. _assert statements fixed to always cause failure, not error. This means that when evaluating the _assert, if an element is not found, it will be handled as a failure and not as an error. Thus the script will continue to execute. Fixed browser stacktrace in case of failure. Removed console.log statements and also added a dummy console.log for older browsers. Removed exception for java and ruby driver while recording confirm and prompt. Changed displayInfo to fix accessor.value for java/ruby controller mode. Assertions when recorded, should not double escape newlines. "a\nb" should not become "a\\nb"
Fixing flakiness due to race conditions in fetch functionality. Fixes collect and count related random failures. Fix for _setStrictVisibility not working on iframes unless page is reloaded. Fixing build recurseInIframes handles different domains. Fixed toLowerCase error if sahi.accessor.ignore_case=true. 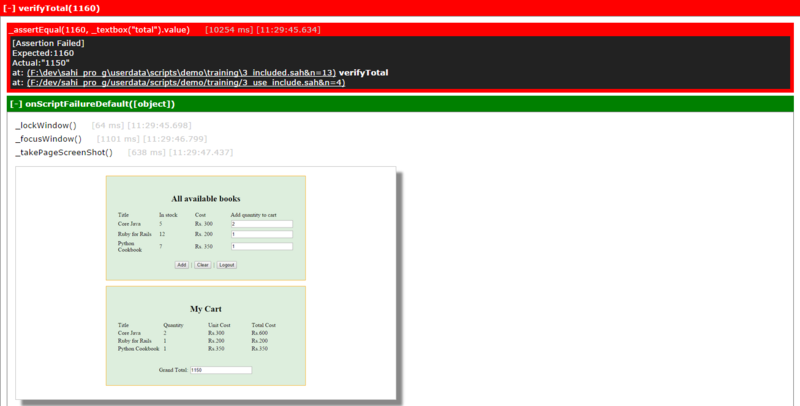 Identification of <object> tag in Opera, IE9 and IE10. setselected now works with selectbox with size > 0. conversion added for java keycodes to phantomjs keycodes.